An adult of the newly described species, Hyloscirtus hillisi. Photo by Gustavo Pazmiño, BIOWEB Ecuador. “To reach the tabletop, we walked two days along a steep terrain. Then, between sweat and exhaustion, we arrived to the tabletop where we found a dwarf forest. The rivers had blackwater and the frogs were sitting along them, on branches of brown shrubs similar in color to the frogs’ own. The frogs were difficult to find, because they blended with their background,” Alex Achig, one of the field biologists who discovered the new species comments on the hardships of the expedition. 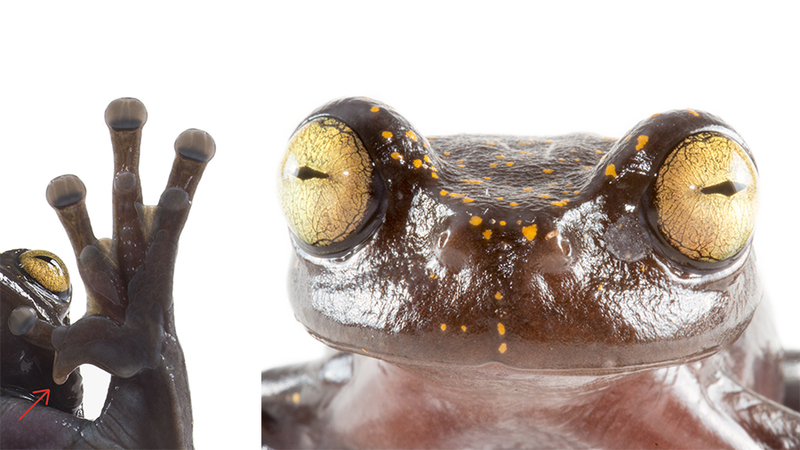 Unlike other frogs, the new species has a claw at the base of the thumb. Photo by Gustavo Pazmiño, BIOWEB Ecuador. The species name, Hyloscirtus hillisi, honors Dr. David Hillis, a member of the National Academy of Sciences of the United States of America, who discovered three closely related frog species in the same genus in the 1980s, while conducting a series of field trips to the Andes of southern Ecuador. Throughout his career, Dr. Hillis has made significant contributions to the knowledge of Andean amphibians and reptiles. Despite being newly described, Hyloscirtus hillisi is already at risk of extinction. It has a small distribution range near a large-scale mining operation carried out by a Chinese company. Habitat destruction in the region has been recently documented by the NGO Amazon Conservation. A metamorph of the new species, Hyloscirtus hillisi. Photo by Darwin Núñez, BIOWEB Ecuador.